with stolen clothes she allegedl stole at a big store in Lagos. The alleged theft took place at Abubakar Street, Abule Egba, Fagba, Lagos. buy clothes at the store but had another motive which was to steal clothes there. She was eventually caught as she reportedly hid the clothes in her bag and attempted to escape. 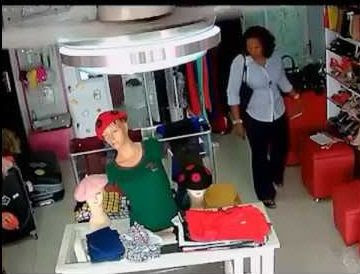 It was gathered that the owner of the store had incurred the loss of several clothes in the past before luck ran out on Ijeoma and she was caught in the act. She was handed over to the police. At the police station, the owner of the store, Awolusi Saheed, stated that the total clothes Ijeoma had stolen from him was about N562,000.